Red Robin's 'Doh! Rings' are possibly the most shameless knockoff of the inimitable Cronut. There have been plenty of notable swagger jackers throughout history: Vanilla Ice famously stole the baseline to Queen’s ‘Under Pressure’ for ‘Ice Ice Baby,’ then sat back and hoped nobody noticed. Now Red Robin is attempting to blatantly steal something and feign ignorance. 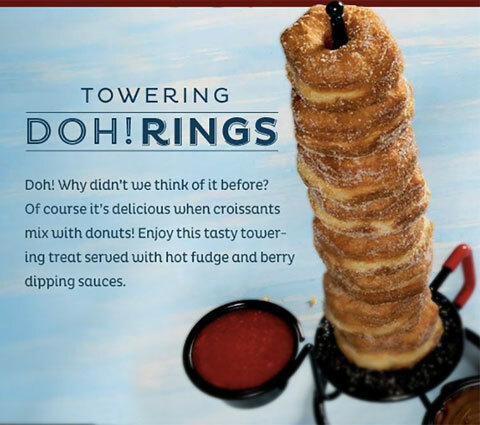 Red Robin is the latest chain to knockoff Cronuts; on its website, the chain advertises its Doh! Rings with the text: “Doh! Why didn’t we think of it before?” Come the $%#& on. Dominique Ansel’s croissant-doughnut hybrid has been around since early 2013, and literally everyone with a computer knows about the pastry and its creator. Both Dunkin’ Donuts and Jack in the Box started selling Cronut knockoffs earlier this year, but they didn’t try to hide the fact that they were stealing somebody else’s swag. What’s even worse: Red Robin’s faux Cronuts aren’t even filled with any pastry cream like the Dominique Ansel original. But they are served eight to an order—because more is always better, right?—and they come with hot fudge and berry sauce for dipping. The Doh! Rings come stacked, on a tray or in a to-go bag. People will, inevitably, flock to the chain to eat the leaning tower of faux Cronuts.